Anne Hourston is hanging up her cycling helmet after retiring from her post duty on Flotta. In an era-ending retirement, the final postie still serving her route on two wheels in the north of Scotland and quite possibly Scotland, has hung up her mailbag for the last time. Flotta postwoman Anne Hourston has retired after many years of service. 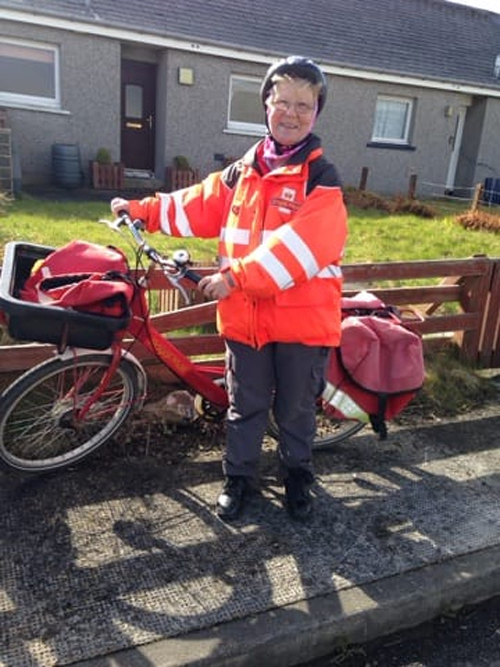 The last cycle postie left in Orkney after the Isles were allocated vans in 2012, Anne, who doesn’t drive, has continued to serve her community on two wheels. Local Royal Mail manager Charlie Alway believed that Anne was the final postie using a bicycle in the north of Scotland and possibly the nation. Praising Anne’s commitment, Mr Alway commented: “Although the advent of emails and internet shopping has seen our mailbag necessitate the move from bikes to vans, Anne’s determination to serve the folk of Flotta in a job she has enjoyed, meant with the help of Flotta SPDO staff, we were only too happy to make her the exception to the rule.